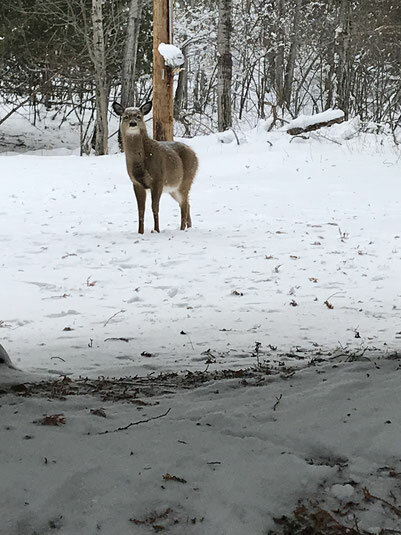 If you have ever visited Manitoulin Island, you have seen our ever present deer. They are in the fields, the highways, the lakes, streams and in our towns. Here in Gore Bay and at The Inn, they are our constant friends. It is worth following the speed limit in town as you can see them in their natural and town habitat! You rarely see one alone, as they like to travel in groups walking or running through a field or high way. They love to eat all that is green and the beautiful flowers found around town. They are very cute, often shy and other times bold! On the island we live amongst the deer and nature alike. So when you come for a visit, remember to be extra careful and lookout for our four legged friend as you never know where you will find them! Here at the Inn they are often in the woods, at the water front or in the driveway! Be prepared to be amazed by these beauties!